Salah has been arrested in his home on the 26th October at 2 am in the morning. 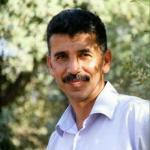 We are currently informed that he is held in Petah Tiwka interrogation centre, located outside of the occupied Palestinian territory - a violation of Article 76 of the Fourth Geneva Convention, which states that an Occupying Power must detain residents of occupied territory in prisons inside the occupied territory. The military court granted 15 days of interrogation during which he will not be able to get legal council or to receive visits from his family. Salah's lawyer has not been informed or even able to trace the whereabouts of his client and is now appealing the decision taken by the military court. We are concerned for the ill-treatment and torture practices he might be exposed to. Earlier this year Human Rights Watch, Amnesty International, Ocha and independent Palestinian organisations reported concerns on ill treatment, torture and general targeting by Israel against Human Rights Defenders.